I love food. Period. Anyone that knows me knows that I love food. I love studying the different ways people combine ingredients to elevate the experience. I am especially fascinated with starting with raw ingredients, nothing processed, and creating delicious food from scratch. I have been very fortunate to eat in gorgeous restaurants during my travels over the year. There have been a few recipes that have blown me away, and you may be surprised to know what they are. Fancy steak and seafood? Nope. I prefer to make them at home due to the fact they are a fraction of the price at the grocery store and really only require simple techniques to let the quality of the ingredients shine. The first recipe that blew me away was at a restaurant called Opera in San Diego, CA. I was invited to a work dinner with one of my favorite companies, Lantern Moon, during a TNNA conference almost 10 years ago. It was a high end Italian restaurant with opera singers walking through the restaurant for entertainment! It was a wonderful experience. I ordered manicotti stuffed with osso bucco in a wild mushroom broth sauce. It was out-of-this-world delicious. First of all, I appreciated that the meat required a long, slow cooking process to bring out the depth of flavors and tenderness. And that combined with a rich, broth sauce, pasta and baked in the oven with cheese? Decadent, rich, full of flavor and unusual pairings. The meal inspired me to think of pasta and meat differently ever since. Last week, I was in NY for a #SecretRendezvous and I had another mind blowing meal. Ironically it was a meat and pasta dish again! It was called Italian Shepherds Pie and it was a baked ramekin with shredded short ribs on the bottom, layered with roasted vegetable broth/sauce, gnocchi and baked in the oven with cheese on top. It was VERY RICH, full of flavor and truly amazing. It was so rich, I ate too much and later suffered with a belly ache in my hotel room. But, that was my own fault, not due to the meal. Upon arriving home, I knew I would take what I experienced with that meal and apply it to ingredients at home. I decided to lighten up the dish a bit, and start with pork loin. I had a good sided one in the freezer so I cooked it all day in the slow cooker with a large can of chopped tomatoes and a small can of french onion soup, along with a few cloves of garlic. I should have made the gnocchi from scratch, but honestly, I just didn't have time today. The idea of sweeping up flour for hours didn't appeal to me in the slightest. Not that homemade wouldn't be INCREDIBLE. Next time... 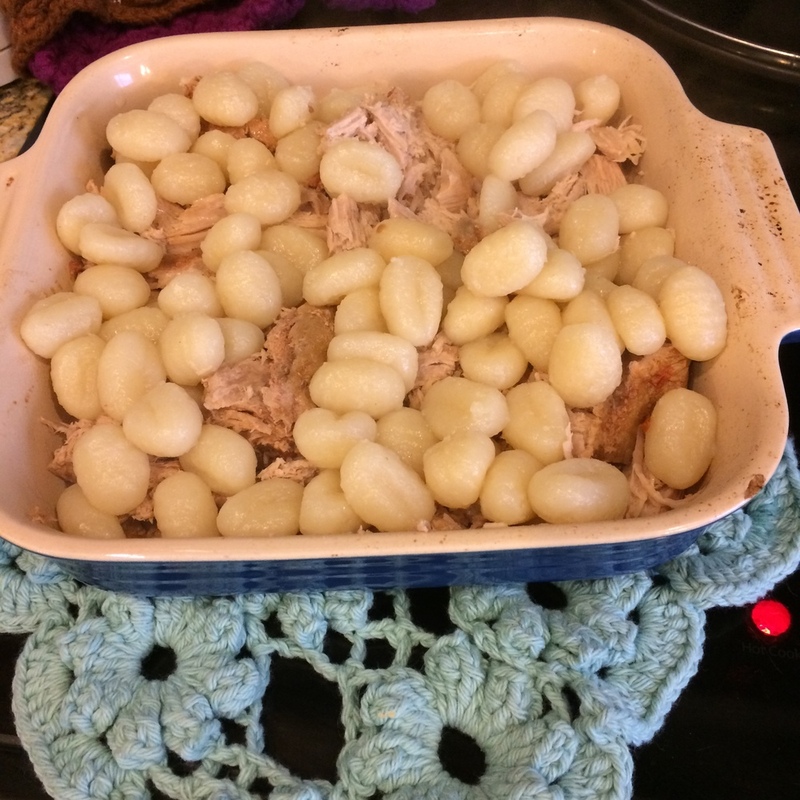 I debated using mashed potatoes or even dumplings, but found some gnocchi at the grocery store and boiled them according to package instructions. I shredded some of the pork into a baking dish. Layered the cooked gnocchi on top, ladled a generous amount of sauce over them and shredded the Italian blend cheese over the top (you could combine mozzarella, parmesan and asiago yourself with even better results). P.S. Please let me know if you try this recipe, or get inspired to try something similar. I'd love to hear from you!